Skin colour is dependent on a number of factors, including the capillary network, blood flow, and particular properties of the epidermis and dermis of the skin, but the most influential factor is skin pigmentation. Pigmentation is a complex biochemical process that involves specific cells located in the basal layer of the epidermis called melanocytes. Skin pigment — melanin — is synthesized in melanocytes and contained within melanosomes, which are then transferred via melanocyte dendrites to the superficial layers of the epidermis1. Melanogenesis results from a biochemical synthesis of melanin from amino acids L-phenylalanine and L-tyrosine. Multiple enzymes are involved in this process, the most important being tyrosinase, which begins the process by converting L-tyrosine to L-DOPA. The level of pigmentation of the skin depends mostly on the activity of skin melanocytes and on their quantity. 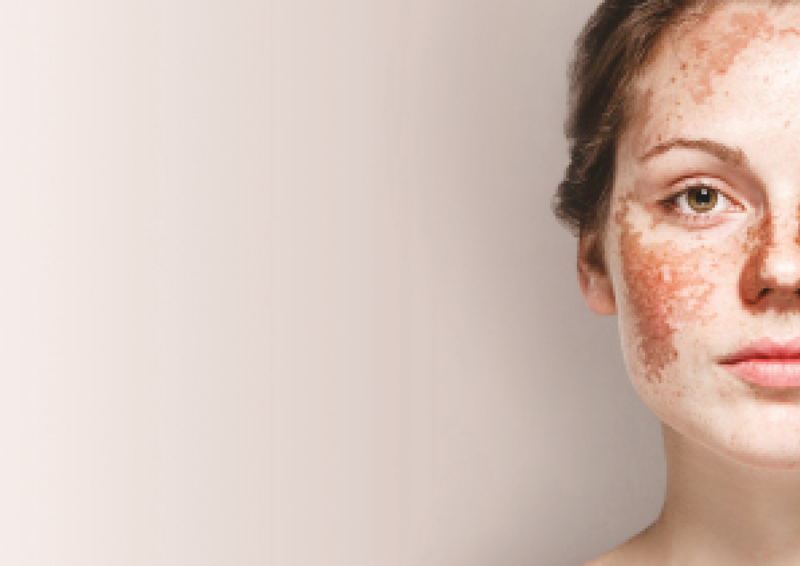 In particular situations, pathologic skin pigmentation may occur, such as hypermelanotic or hypermelanocytic disorders, resulting in the appearance of darker pigmented patches on the skin. Melanogenesis in general is a protective reaction by the skin exposed to UV irradiation, which causes UV damage (photodamage). The skin, subjected to photodamage, increases the thickness of the corneum layer and the production of melanin. Therefore, melanin production has the primary function of protecting the skin from UV-rays and its synthesis is activated by the biological damage itself2. Photodamage causes the release of a specific hormone called MSH (melanocyte stimulating hormone), which acts on the melanocytes by activating the synthesis of melanosomes containing melanin and their transfer to the epidermal cells. The first step after photodamage is the release of a polypeptide, the POMC (pro-opio-melanocortin), which is then divided into smaller fractions, one of which is represented by the MSH. Cellular damage leads to activation of the ATR (ataxia telangiectasia and RAD3-related protein), a serine/threonine specific protein kinase that acts as a phosphorylating transcription factor p53 that regulates the cell cycle and its response to injury. After protein kinase activation, the epidermal cells begin to secret POMC. This polypeptide is then divided into smaller portions — the ACTH, the MSH, and beta-endorphins; the latter are responsible for the sensation of pleasure that follows sun exposure. MSH is a hormone that plays different roles at the central level (hypothalamus) and peripheral level (skin), by acting on the MCR (melanocortin receptor). In the hypothalamus, the stimulation of melanocortin 3 and 4 receptors (MC3R, MC4R) by MSH, regulates food intake largely by inhibiting the appetite and activating the metabolism. In the skin, the stimulation of the melanocortin 1 receptor (MC1R), stimulates the melanocytes to synthesize melanin. The stimulation of MC1R induces the formation of a transcription factor, called MITF (Microphthalmia-Associated Transcription Factor), that allows the reading of the genes responsible for the synthesis of the enzymes necessary for the conversion of tyrosine into melanin. The tyrosine, by the action of tyrosinase, is transformed into DOPA, this then follows two different synthetic routes, the first leads to the production of eumelanin (black) and the second to the formation of pheomelanin (red)3. Tyrosinase is an enzyme containing copper that catalyzes the production of melanin from the tyrosine through oxidation (oxidase). It predominantly deals in the oxidation of phenols, such as tyrosine and dopamine, using oxygen. 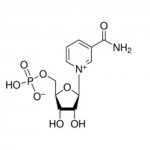 The tyrosinase is selective of its substrate and only uses L-tyrosine or L-DOPA. The enzyme is synthesized in the melanosomes inside the melanocytes in the skin4. Tyrosinase is a single chain glycoprotein that appears to be synthesized in ribosomes and transferred through the endoplasmic reticulum to the Golgi apparatus, where it is glycosylated and packaged in vesicles called premelanosomes. The process of glycosylation is essential for the spatial arrangement of the newly formed protein and for the creation of its active site5. In the presence of alpha-glucosidase inhibitors, the function of tyrosinase is completely inhibited6,7. Besides activation of melanogenesis, UV irradiation causes specific photodamage to the skin resulting in so-called photoaging. Most harmful in terms of photoaging is UV spectrum A (320–400 nm), which penetrates deep into the skin down to the superficial hypodermis and negatively affects dermal proteins, collagen, and elastin. UV spectrum B (280–320 nm) penetrates to the superficial layers of the skin, mostly epidermis, but both UV spectrums can cause burning and mutagenic effects, immunosuppression, and pigmentation. In this regard, photodamage, photoaging, and pigmentation are closely linked. This fact should be taken into account when performing aesthetic procedures aimed at pigmentation removal — to not just remove the superficial signs of ageing but to influence the ageing mechanisms in the skin. The other important factor to be considered is that if the photodamage level is high enough, it will result in the granules of melanin spreading into the dermis layer of the skin, and this pigmentation is rather enduring, because, unlike the epidermis, the dermis is not regularly renewed. This leads to the formation of a stable skin imperfection. And while this can be treated by removing the thickness of the dermis containing the melanin, the traumatic nature of the treatment can result in a new post-inflammatory melanogenesis. 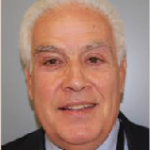 This issue is attributable to the majority of damaging procedures currently used, including chemical and laser peelings, dermabrasion, and phototherapy, especially in patients with darker phototypes8. The only other option remaining to remove hyperpigmentation is the phagocytosis of melanotic granules by macrophages. It’s possible to activate macrophages to stimulate the phagocytosis process and melanosome elimination, by stimulating the tyrosine kinase receptors defined as CD449. These receptors are activated through the binding with injected hyaluronic acid fragments between 20 and 38 monomers (8,000 to 20,000 Daltons)10. Moreover, acetylglucosamine, as the final product of the metabolization of hyaluronic acid, acts as an inhibitor of the glycosylation of tyrosinase, blocking its function as well as the biosynthesis of the new melanin11,12. Multiple findings suggest that succinic acid also has the ability to reduce pigmentation13. Succinic acid is a dicarboxylic acid with metal chelating potential14, and a particular affinity to copper12. Copper is present in the active site of tyrosinase, and has a vital role in the activity of this enzyme15,16. The chelation of the copper in the tyrosinase results in blocking its enzymatic activity and complete enzyme function loss17. Furthermore, the succinic acid belongs to the category of weak acids, and has both an acidifying and antioxidant action. Sodium succinate, introduced into the dermis, dissociates freeing succinic acid, which develops its antioxidant activity by inhibiting the melanic effect of free oxygen radicals, and inhibiting the oxidizing action of the tyrosinase, needed for the processing of the tyrosine and the DOPA17. The reducing action of succinic acid determines, as in the case of ascorbic acid, the clearance of the melanin from the oxidized state (black), and in the reduced state (brown) decreases the intensity of the melanin colour18,19. One of the most popular ways to correct of skin ageing is via injections of hyaluronic acid. However, practical outcomes show clear advantages with the combination of hyaluronic acid and other active ingredients over hyaluronic acid as a monotherapy20. The combination of hyaluronic and succinic acids is already a well-established solution used for anti-ageing skin injections. Three concentrations of hyaluronic acid solution (11 mg/ml, 18 mg/ml, 22 mg/ml) and succinic acid (16 mg/ml), injected (papular technique) every other week, 3 to 5 sessions20. The procedure should be performed in accordance to the type of skin ageing and the site of application. Small wrinkles as well as other photoaging signs normally require minimal to medium concentrations of HA (11–18 mg/ml) and use of the papular technique — intradermal papules with 0.5–1 cm spacing. Larger mimic wrinkles require either the papular or linear technique, and medium to higher concentrations of HA (18 mg/ml and 22 mg/ml for the linear technique). The periorbital area should be treated with lower concentrations of HA while the forehead might require medium to higher concentrations. It is recommended to start with a less concentrated solution in order to initiate metabolic processes in the skin dermis and switch to higher concentrations for the second/third procedure if needed. 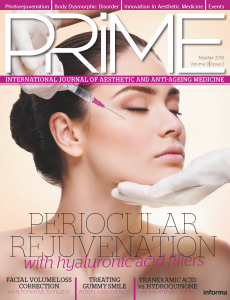 The outcome of procedures using this combination of HA and succinic acid were rather significant, including skin lifting, deep moisturising, and smoothing, as well as an improvement of the colour of the skin and reduction of pigmentation. This effect on the skin was put into the name of the procedure — redermalization21. Since the decision to use redermalization as a more effective treatment in skin rejuvenation, at least two studies have suggested that using HA with sodium succinate can increase skin tightness, reduce sagging, and moisturize the skin22,23. In these studies, increased skin elasticity was observed in participants treated with mono-component HA products, whereas in skin treated with a HA product that included sodium succinate, a significant improvement in overall skin quality was observed due to an increase in its turgor and elasticity, improved hydration, and colour correction. Results in older patients were more visible, and skin defects experienced accelerated healing at skin biopsy sites after treatment in all study patients when compared with the same biopsy areas before treatment. A recent study indicated that the treatment has a more noticeable impact in comparison with mono-component HA products (the study included 5 female patients at the age 28–50)22. Semi-quantitative histological analysis of skin biopsies in all patients also suggested the greater influence of HA and sodium succinate on the structure of the dermis and capillary network of the skin. The number of fibroblasts appeared to increase by 300% versus the 200% increase shown with products containing only HA (preparation and culturing FB, selected from human skin biopsy performed by standard procedure)22,23. Results are visible immediately after the first procedure is performed, especially with medium to higher concentrations of HA. Though obtaining better aesthetic results normally requires 3 to 5 sessions. The result achieved during treatment typically last for 6 to 9 months though residual after-effect related to the stimulating action of the succinic acid might last much longer. However, in order to receive better results over the long-term, it is recommended that redermalization sessions are repeated once or twice in a 9 month period. 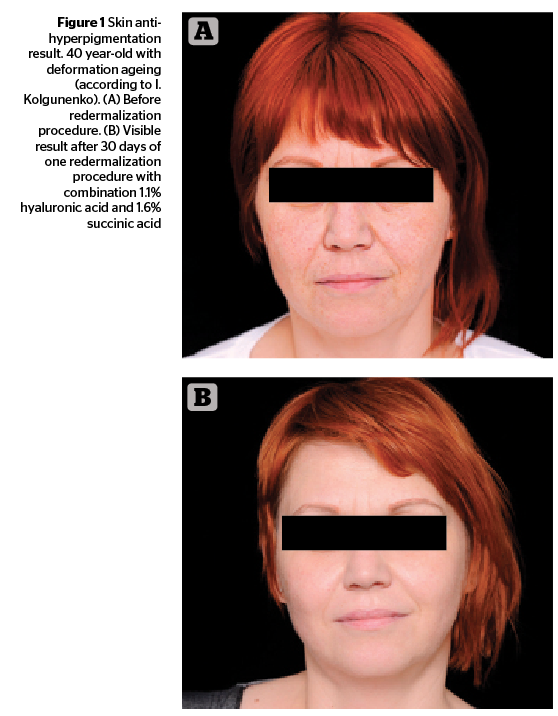 Redermalization should be especially considered in complex clinical situations when a patient requires a diversified anti-ageing solution and not just lifting or anti-wrinkle treatments. Patients with skin pigmentations as well as other signs of photoaging should consider redermalization as possible alternative to laser resurfacing or chemical peelings. Patients who cannot tolerate longer recovery periods of the aforementioned procedures should also consider HA plus SA injections. If moisturization is the main purpose, patients might undergo a traditional procedure (injections of HA alone). 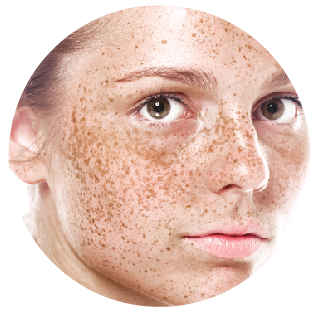 Skin hyperpigmentation is a common aesthetic problem related to excess UV irradiation to the skin. But as long as UV irradiation causes a diversified negative impact on the skin resulting in photoaging, treatment for hyperpigmentation should be approached in a comprehensive way tailored to the needs of the patient. Combinations of hyaluronic and succinic acids have reasonable scientific merit and practical data supporting their anti-ageing properties, as well as reducing skin pigmentation. Further clinical trials should reveal more data in this regard, which will allow us to use this method even more effectively. 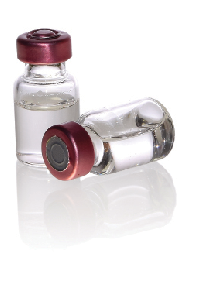 Is succinct acid for injection readily available in the US ? If so does anyone have a supplier ?